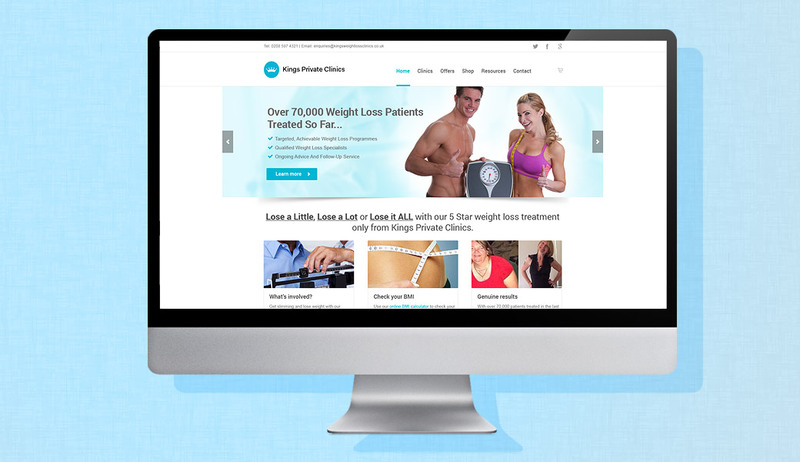 Kings Private Clinics came to Netryx looking for a brand new website that would generate leads and allow them to sell products from the clinics. The new website needed to replace 2 other websites that were costing money but doing nothing for them in terms of lead generation. The old websites were also being managed by people who had no idea how a lead generating website should be designed and managed. 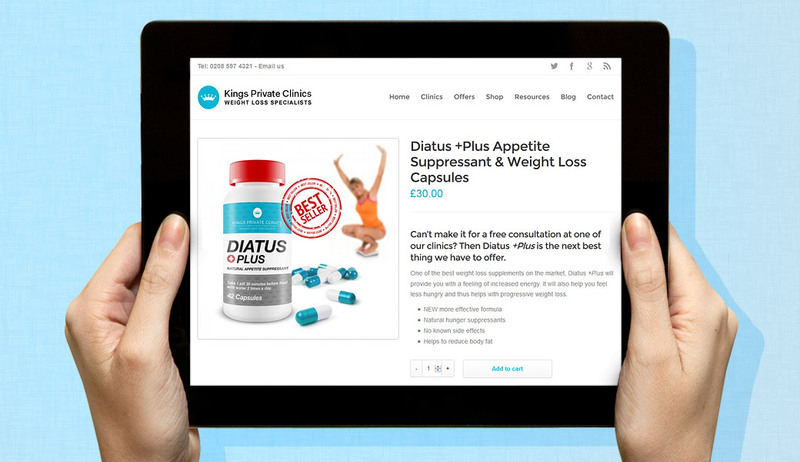 The client focus was on weight loss and more specifically weight loss around the London area. We did a whole host of keyword research and competitor analysis before we even agreed on a domain for the new website. Doing this helps inform the overall structure of the website as well as the content orientation. The existing logo was never going to fit in with the new web design. It was not properly designed and lacked the professional simplicity we were trying to achieve with the new website and overall messaging. The new logo we designed is clean, simple and professional. 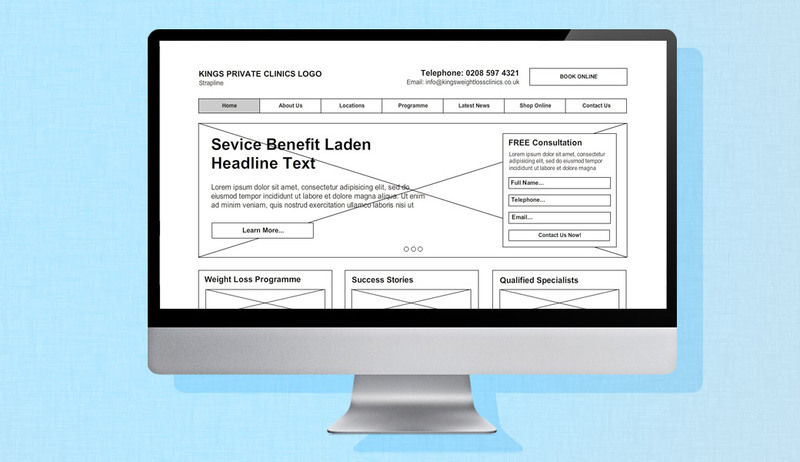 With any website we build we always start at the wireframe stage. This helps everyone involved have a chance to think about the website and its structure before we move to the design stage. The keyword research always informs the way we approach seo content creation. The content and website structure are built around the requirement of the search engines equally as much as the requirements for the website in regard to functionality and visitor experience. We took the content supplied by the client and wrote in our researched keywords. We also wrote additional seo content for the news section. 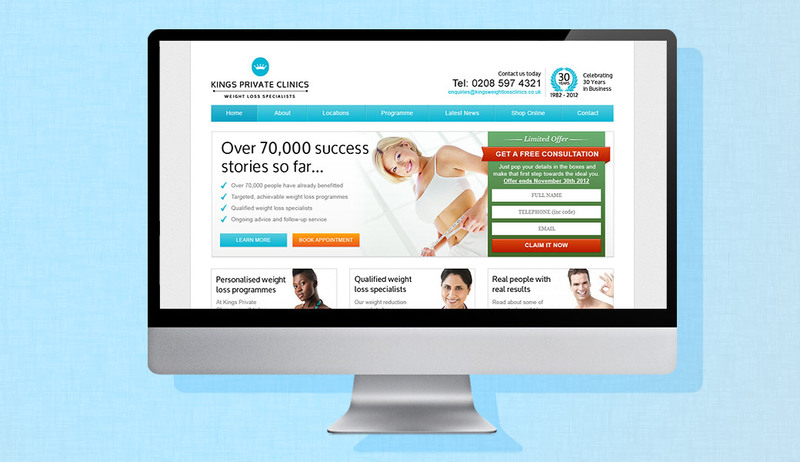 Kings Private Clinics has four weight loss clinics in total, so this gave us the opportunity to create additional pages that could be optimised for keywords we hadn’t been able to inject into the rest of the site. There are on-going requirements for seo copywriting and content creation. Through discussion with the client we wanted to be able to offer potential customers something solid that would encourage them to get in touch. We agreed on a free consultation that we then placed across the site and combined with specific terms & conditions to ensure a level of qualification was met before the consultation was given. The main message we agreed was the wealth of success stories Kings had accrued over the years. We felt that when combined with a solid offer the overall effect of the message would be incredibly positive in driving conversions through the website. The website was submitted to 900 directories a month before we were due to go live. We put up a page of unique content on the domain as soon as possible. Doing this helps get the website indexed and gives it some time for links that are being built to take effect before the site is fully up to speed. There are on-going requirements for link building services.